It’s true! I am a Londoner and have never been, until now, to the Hard Rock Café. My guest boasted that he had been before, but that was back in 1975! Yes, this restaurant is iconic and although its food is quintessentially American there is so much that is British. Hard Rock Café was founded in 1971 by Isaac Tigrett and Peter Morton. They were a couple of American lads who, at that time, couldn’t find a good and authentic burger in London. That is hardly surprising as it was hard for anybody to find good food of any kind in London restaurants in those times. Thank goodness we have moved on to become one of the most respected culinary capitals in the world. This space was once a car showroom. I assume the cars were high-end as this is Mayfair, after all. It has a buzzy ambiance even for lunch. It’s popular all year round so come early or book a table in advance. Even in daylight it has the air of a night haunt. Walls are painted in dark hues but illuminated with neon and flickering TV lights. The decor here is just as much a focus for diners as is the food! In 1979 the café started to give more than a casual nod to music. 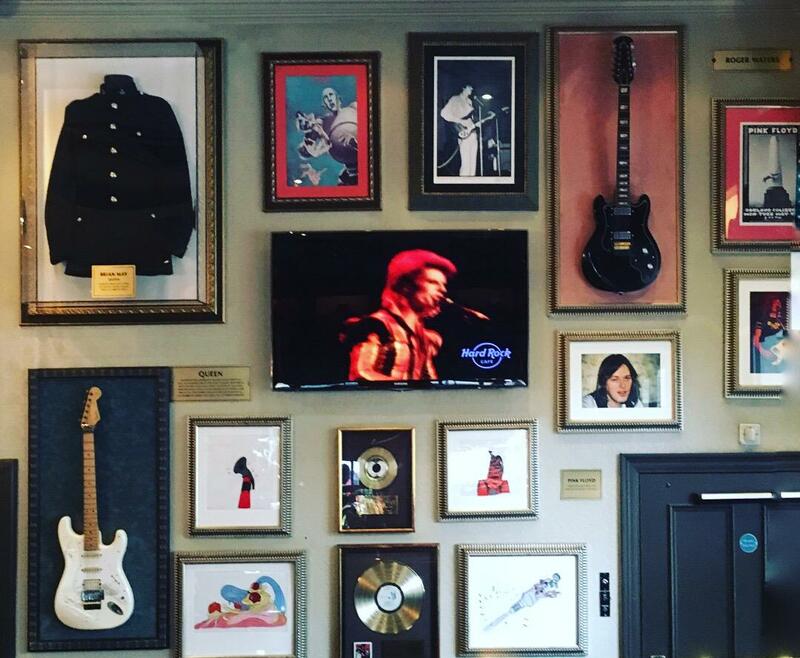 They began covering the walls with rock memorabilia. Now, Hard Rock Café is famed for its collection which has items donated by rock celebrities, but also others acquired at auctions. There are autographed guitars of players of which one has actually heard. It all started with an un-signed Red Fender guitar from Eric Clapton, who came here often. The management hung the guitar over Eric’s preferred seat – a bit like having a blue plaque on the front of a house. A classy ‘Clapton Woz ’ere’. Hard Rock’s archive has expanded over the years and now includes tens of thousands of items, and is the largest private collection of Rock and Roll memorabilia in the world. Many of us are grateful to Eric Clapton for donating a guitar rather than a football shirt! Pete Townshend of the Who contributed, and there is also Les Paul’s instrument. The name of this jazz guitarist and inventor is synonymous with the electric guitars which he modified. 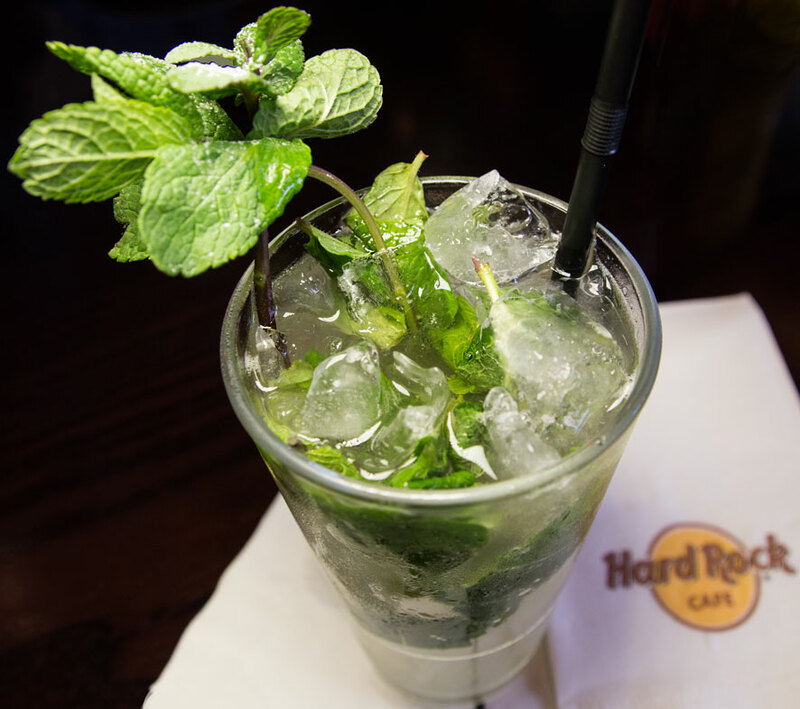 Many rock lovers will come to the Hard Rock Café to wonder at the walls, but they will stay for food …or at least a cocktail. The rest of us will be more interested in the menu, and likely enjoy the guitar scenery while eating. The food is American in style and size. Be warned – come hungry. Lots of classics and traditional favourites appealing to locals and tourists alike. We started with a brace of cocktails. Mine was a classic Mojito. Tall, well-iced and with a considerable bunch of fresh mint. My guest chose a pale pink and berry-laced confection called Southern Rock, that included vodka, Southern Comfort and Tennessee Whiskey. He pronounced this well worth a try. It offered full-on luscious berries and a good belt of alcohol. Our starters arrived, and on reflection we might have ordered too much. Yes, just two items, but one of those was the celebrated Nachos, and enough for a small family. It was a platter of Tortilla chips with three-bean mix, Monterey Jack and Cheddar cheeses, pico de gallo, jalapeños and green onions, garnished with sour cream. Those jalapeños added a great sharp and spicy edge. The cheeses were melting and the pico de gallo refreshing. 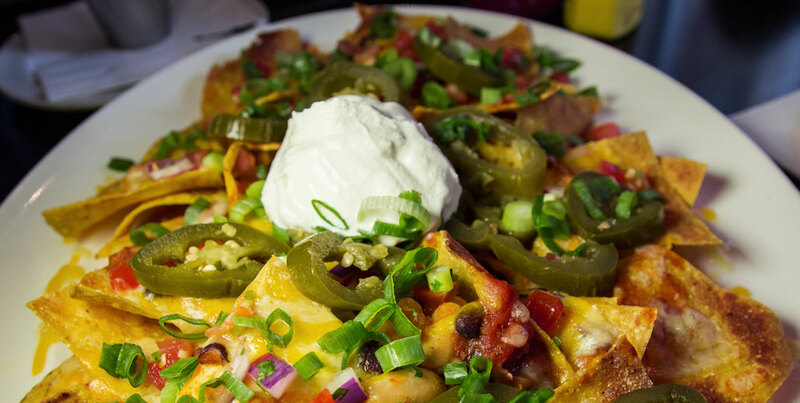 If a visitor has little time to linger then Nachos and a beer could be the lunch of choice. But there was more! We also had the second starter and that was a simple delight. Tupelo Chicken Tenders were unfussy, ungarnished and perfect. Not a spot of oil on these hand-breaded, lightly fried tenderloins of chicken. They were crunchy and moist and served with honey mustard and hickory barbecue sauces. I wish I had the recipe for the latter sauce, which would elevate an American baseball cap into a culinary triumph. My main course was the Famous Fajitas with grilled beef. That meat was tender and flavourful and presented atop a sizzling pile of onions and peppers. There were the expected fixin’s of pico de gallo, Monterey Jack and Cheddar cheese, fresh guacamole, sour cream and warm tortillas. A winner of a spread. The Texan was my companion’s choice. This was a burger bun stuffed with hickory-smoked pulled pork with chipotle barbecue sauce, cheese, crispy fried jalapeños and onions. The guest is offered the ‘Go Big’ option: I am telling you now, so you can get into training. Portions are generous here, but one can ask for any leftovers to be boxed, for snacking later. 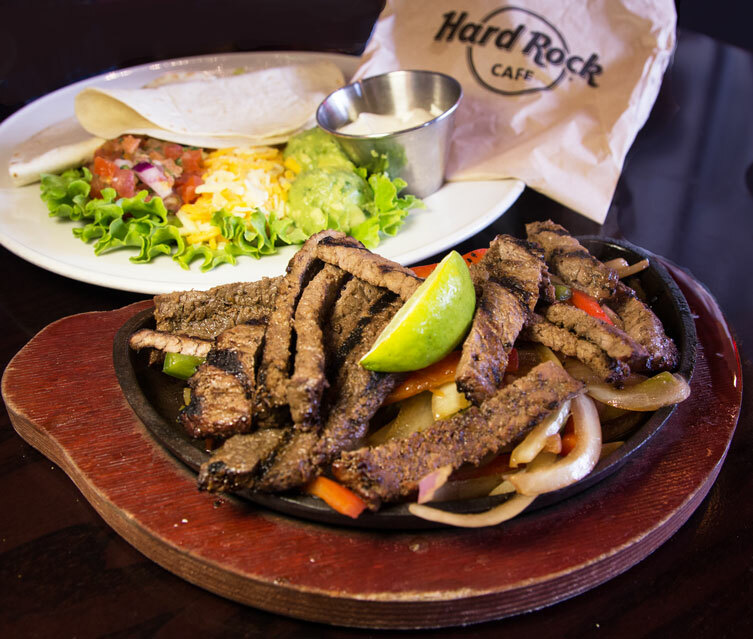 I had expected Hard Rock Café to be good but in fact it was excellent. No, the food isn’t Michelin Star but it is comfort food done well, and could be described as gourmet Americana. It’s a casual spot with great character and perfect for families during the day and groups at night.